There are many signs and symbols from around the world that are seen as lucky. Others are thought to bring good fortune to the people that possess them. Some of these symbols are even believed to grant wishes, heal the sick, or ward off evil and curses. These signs and symbols often include four leaf clovers, horseshoes, shooting stars, lucky pennies and many, many more. Others state that luck is when preparation meets opportunity. Whether you believe in lucky signs and symbols or not Swaggernauts, do you hear that knock? Opportunity is knocking! 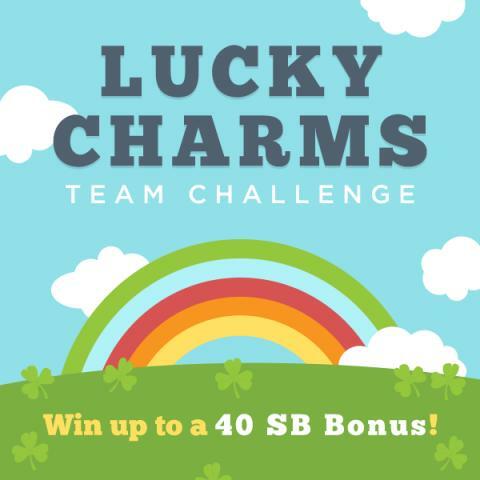 It’s Swagbucks Lucky Charms Team Challenge! The Lucky Charms Team Challenge begins Monday, March 14th at 8:00am PT/11:00am ET and ends at 12pm PT/3pm ET on Friday, March 18th! In the meantime, don’t walk under any ladders and avoid all black cats! If you're feeling lucky, join a team now because Pre-registration is currently OPEN! All Swagbucks members who participate and contribute at least 300 points to their team’s total will receive a SB bonus in the form of a SB Swag Up Rebate! Members of the 1st place team will receive a 40 SB Swag Up Rebate, members of the 2nd place team will receive a 20 SB Swag Up Rebate, members of the 3rd place team will receive a 10 SB Swag Up Rebate, and members of the 4th place team will receive a 5 SB Swag Up Rebate! Your SB Swag Up Rebate will be made available on Friday, March 18th by 4pm PT/7pm ET and will expire on Thursday, March 31st. Pre-Registration starts Thursday March 11, so what are you waiting for, sign up now! Disclosure: This is a sponsored post for Swagbucks. Links contained in this post contain my referral information.